Investors may have been surprised by the steepness of Wednesday's stock market sell-off, but the market has been sending clues of a pending pull back. The sell-off could continue into the earnings season, which begins Friday, but some analysts expect a positive end to the year because the market often gains after midterm elections. The biggest worries for stocks are rising interest rates and the potential impact of trade wars on corporate profits and the global economy. The steepness of Wednesday's stock market sell-off may have surprised investors, but a correction has actually been brewing in small-cap and technology stocks all summer and the shakeout could continue. The latest trigger for the sell-off was a jump in long-term interest rates, but strategists say the market is also concerned about trade wars' impact on corporate profits and on the global economy. Therefore, the focus during the upcoming earnings season could be on whether trade wars and tariffs are hurting corporate sales or margins. A number of companies, including giant industrial coatings maker PPG, already have pointed to higher input costs. "People are worrying about rising inflation eating into corporate margins, and they're worried about the impact of the Fed moving too quickly," said Lori Calvasina, chief U.S. equity strategist at RBC. Calvasina expects the market to remain choppy into the earnings season, which begins Friday when major banks report. The Dow on Wednesday lost 831 points, or 3.1 percent to 25,598, in its worse day since February. With tech at the center of the sell-off, the Nasdaq was hit even harder, down 4.1 percent, in its biggest drop since June 2016. The S&P 500 was off 3.3 percent on Wednesday, at 2,785, and the S&P technology sector dropped 4.8 percent, its worse day in seven years. Eighty percent of stocks in the sector and in communications services, which includes Facebook and Alphabet, are already in a correction of 10 percent or more. "We've had this rolling correction. It started with the small caps over the last couple of months and now, they're getting to the mega caps. The correction sort of rolled and we're finally getting to the big boys," said Peter Boockvar, chief investment strategist at Bleakley Advisory Group. 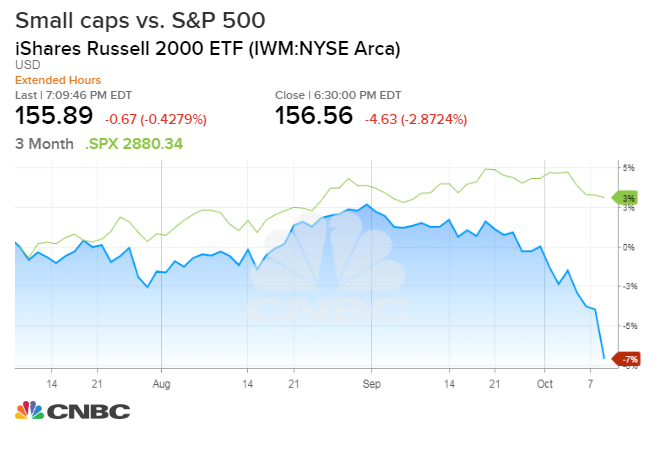 The small cap Russell 2000 lost 2.9 percent Wednesday, to 1,575, and it is now down about 10 percent from its all-time high reached in late August. The S&P and Dow are about 5 percent below their all time highs. Thursday's premarket trades indicated further losses. As the market sold off Wednesday, investors watched technical levels, an important road map in a correction that are not just followed by chart analysts. Strategists expect the market to test another key momentum level Thursday morning. 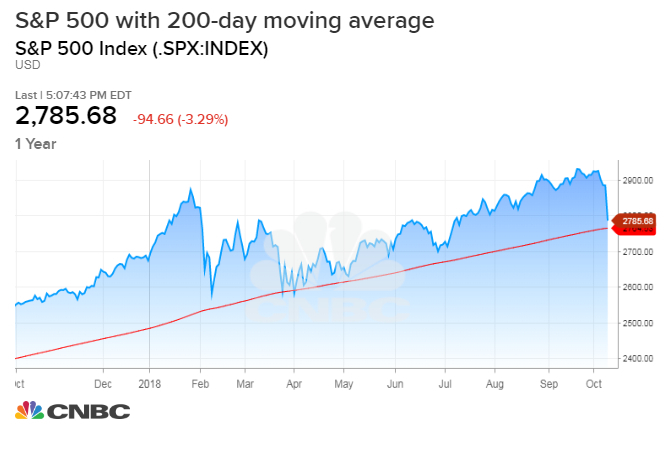 "Considering the Russell 2000, the Nasdaq and the Dow Transports all broke below the 200-day [moving average], the S&P will at least test its 200-day about 20 points lower than here. We are getting oversold so we could get a bounce any day now," said Boockvar. "Some big trend lines are getting broken, and the interest rate story is only picking up steam. We're at the beginning of earnings season where companies are only beginning to talk about tariffs. It could be a really choppy next couple of weeks." Treasury yields, which move opposite price, began to rise quickly last week after Fed Chairman Jerome Powell indicated the Federal Reserve still has a way to go to raise interest rates. 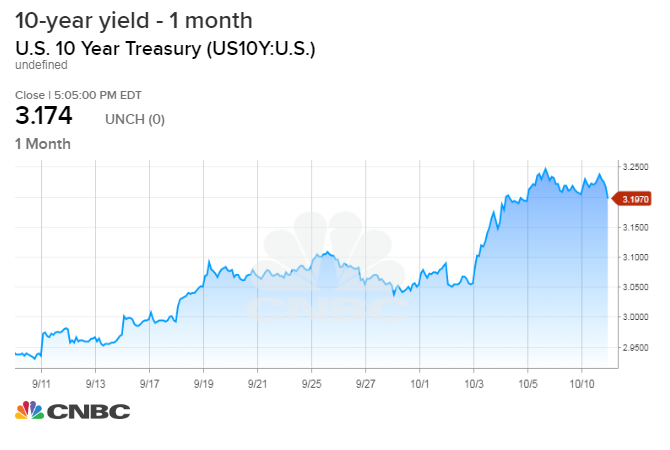 The benchmark 10-year Treasury yield, which impacts mortgages and other loans, briefly reached a high of 3.26 percent this week, breaking through the year-end target of some bond market strategists. That run-up unnerved some investors who see higher interest rates as a threat to corporate profits and as a potential lure for investors to shift money away from stocks into higher-yielding fixed-income investments. "People got really freaked out last week on inflation and rates moving up too fast," said Calvasina. President Donald Trump is one of them. In comments after the market close, Trump said the Fed has "gone crazy" by continuing to raise interest rates. Powell said at the Fed's latest press conference that he had not discussed interest rates with the president. But investors have already been looking for some reprieve from Fed rate hikes, even as the bond market continues to price in higher rates. "The S&P is down 4 percent from an all-time record high," said Boockvar. "Anyone who thinks the Fed is going to bend is delusional. ...The S&P is just back to where it was in July." Calvasina said the weakness in technology and the communications services sectors this summer was a warning for a broader market sell-off. "Tech has had massive overcrowding problems," she said. She said the sell-off in social media was also a sign. "We've been warning people on this. People just didn't want to see it." 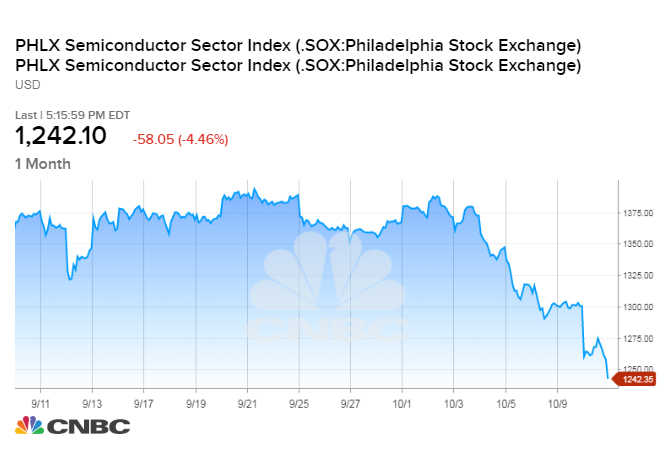 Semiconductor stocks have been hammered, and are down more than 7 percent for the month. Calvasina said that group and hardware were sold because of concerns they would be hurt in a trade war, but now the selling has spread to software and the internet names. "When inflation expectations are rising, things like energy, financials, materials outperform and growth areas of the market, like tech, consumer discretionary and the new communications services underperform," she said. The strategist said she's cautious going into the earnings season and expects to see a choppy market, but depending on how the market trades, the post midterm election period could see gains. Analysts have been expecting a stronger fourth quarter, based on the historical, strong performance of the market after midterm elections. Calvasina said the market expectations are that Democrats regain the House majority and Republicans hold the Senate. But it would be a positive for stocks if the GOP held both houses and negative if the Democrats took both. Scott Redler, partner with T3Live.com, said some of the FAANG names, Facebook, Alphabet and Netflix, had issues last earnings season. "Netflix, Facebook, and Twitter and also Alphabet, all four of them got put in the penalty box after earnings, as the Dow also made new highs over the summer. The only strong FAANG names were Amazon and Apple," he said. "Two weeks ago, when the Dow made all time highs, the new low list was bigger than the new high list. That gave traders a bit of caution," Redler said. Redler expects the market to try to bounce at some point soon. "If it's a feeble bounce, or not potent, there's still could be a couple of rough weeks ahead," he said.